Join us this Saturday, December 30 at Downtown Books in Apalachicola, 1:00 pm – 3:00 pm, for a book signing and launch of John Spohrer’s new novel. 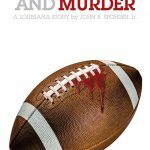 LOVE, FOOTBALL AND MURDER is a mystery suspense novel set in Louisiana in the mid-1980s. Here is a link to John and the TV ad for the event. Book launch and signing. December 30, 1:00-3:00 pm at Downtown Books in Apalachicola.